Deldotb has just finished his touch screen mod for Dell Mini 9. 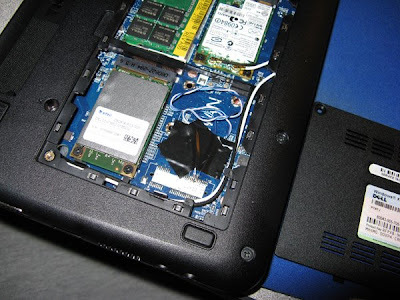 I hope JKK test Asus EEE PC 901 with RunCore Pro 16/32GB Mini PCIe PCI-e SSD Solid State Drive with Dell Inspiron Mini 9 (RCP-I-M5016/32-C) on primary SSD as OS, because I assume this PCIe PCI-e SSD the only SSD can fit in on 901 primary SSD and other bigger capacity on secondary 901 like SSD RunCore 64/128GB PATA Mini PCI-e PCIe SSD (RCP-I-M764/028-C1). nice mod i had one too on my 900 and it worked good. taking the usb from an external port i think is much easier. i did it on my 900 too. I wish that I'd have read a little more about the GPS hack. I'll go back and modify my touch screen hack to use the pci-e pins this weekend... the USB connector was just way easier and I have problems seeing the pins! What program is used in the video? And when will there come a 10.2" touch screen kit available for those of us that have the Samsung NC10? there are 10.2 inch touchscreens but i dont know if they fit in a samsung nc10. look at ebay and ask the seller. I have updated instructions at http://dellmini.restmass.net. I also managed to incorporate the "GPS" hack to connect to the internal USB bus now. Got my third USB port back. I just ordered a Mini 9 for loaning/company use for my small business. I'm just itching and looking forward to modding it as you and some other owners have. I do have a question though: how does the touch screen and GPS mods (together or separately) affect battery life? The Mini 9 can go about 4-5 hours, and I'm assuming the GPS unit could be turned off... but yeah. Anyways, keep it up guys! There are several vendors on ebay that sell touch interfaces. A review of these would be very helpful. You could discuss lag, image distortion, drivers, etc. Deldotb complained that the lag was aggravating. It would be nice to know if some touch screens are better than others. JKK, how do you feel about the several that you have used? Worthwhile? Any information on the devices themselves would be beneficial to potential modders. Has anyone put in a GPS and a Touchscreen? I've given up hope that there will be an affordable touchscreen netbook with these features that is capable of OS X anytime soon, so this is a possible solution! Thanks very much for your review and advise it's very positive contribution. I was searching for this information for some days I finally find your blog. it have to be very simple and intuitive function for the people that don't have familiarity with computer. if someone advise me how is going to do? OMG how is this possible?